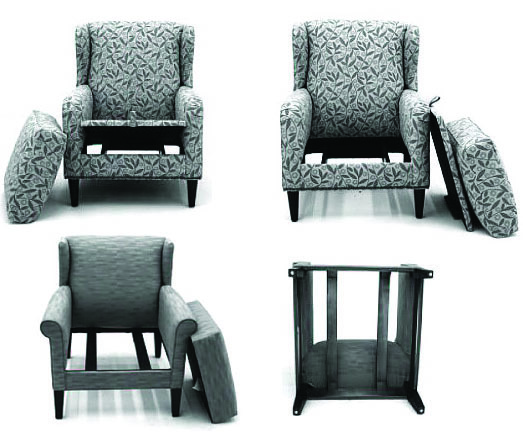 Furniture for Incontinence-Making Upholstered Pieces Fluid-Resistant. Furniture designed for consumers with incontinence can be made more effective with a fluid-resistant fabric deck. A fabric deck is an enhancement to a standard piece of upholstered seating. With fabric decking, fully upholstered furniture is made with a fluid-resistant piece of fabric under the cushions. To help you picture what this is, if you were to pick up the seat cushions on your sofa at home you would most likely have a deck made out of a thin black cloth. When constructing a piece of furniture for an incontinent environment that piece of cloth can be replaced with a fluid-resistant piece that will help in preventing urine from soaking into the furniture frame. The upholstery fabric is another important component for furniture used in an incontinent environment. A variety of fabric options are on the market are readily found through contract furniture distributors. Products like Crypton are fabrics that are a fluid-barrier that is completely infused into the entire weave of the fabric adding permanent protection throughout the entire piece of fabric. There are also surface fabric treatments like Teflon that are added to the top of the fabric to add an element of fluid protection. More traditional solutions like vinyl fabrics are still an excellent option for dealing with incontinence. In recent years, vinyls have taken a major fashion step forward and are now made in beautiful designs and textures that you can be proud of. A newer addition is polyurethane fabrics. Polyurethane fabrics are soft and pliable which creates furniture with a high level of comfort. Regardless of whether you choose specialized fluid-resistant upholstery fabric or specialized upholstery with a fluid-resistant seat deck, not allowing urine to sit for long is essential. Although fluid-resistant fabrics aid in protecting your furniture none of these solutions can entirely prevent urine from soaking through fabric weave and wood grains when allowed to sit too long.